In traditional Chinese medicine, alfalfa has been used to treat gastrointestinal problems and cough, while in India it has long been uses for supporting digestion and as a treatment of boils, water retention, and even arthritis. Native Americans used alfalfa to promote blood clotting and treat jaundice. 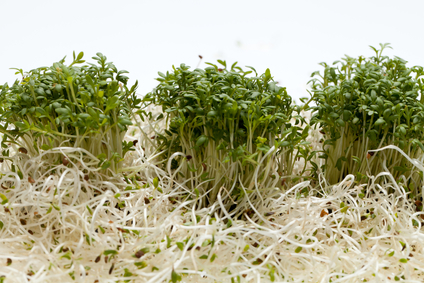 Today, some preliminary research suggests alfalfa can reduce cholesterol and artery plaque formation. Alfalfa also seems to have some ability to lower blood sugar. Obesity is an epidemic in North America, and it contributes to diabetes and heart disease. So this this humble little sprout may have the potential to help with some of the most important health issues of our time. Like all legumes, alfalfa contains some protein. It is also packed with powerful antioxidants (vitamins A, C, E, and K) as well as vitamins B1 and B6. It also contains calcium, potassium, iron, and zinc. Alfalfa herb (the dried leaf, as opposed to the more familiar sprouts) has a very mild flavour and can be mixed with different salads and soups without much change in taste. Alfalfa leaves contain saponins, compounds that block the absorption of cholesterol and prevent the formation of plaque. They also contain flavones and isoflavones, which are thought to be responsible for estrogen-like effects: although this has not been confirmed with human trials, alfalfa is sometimes used to treat menopause symptoms.